I disable the option and my drl lights turn off even with hndbrake down. I have to confess that I agree with most of your arguments. However, motoring law in the UK appears to insist that DRLs be used if they're fitted to the car, and therefore, being a law-abiding person, I choose to comply with that. Massimo23's info on how to provide an option for turning the DRLs off via a re-coding in VCDS is quite interesting. As someone who's invested in VCDS, it's tempting to implement it. However, I don't see any point in doing so, given that 90% of the time you'd have to have the DRLs on in order not to risk getting stopped by the police when you're driving around. If the law was less stringent on this - for example, if the use of pre-fitted DRLs were made voluntary - I'd be one of the first drivers to re-code my Polo to the optional infotainment setting and I'd turn mine off. Are you squeezing the lemon? Thanks Ciclo , there is a lot of lemon to squeeze software wise on these newer cars. Well ive already bought the bulb holders vw partnumber 6R0953123A which take ba15s bulbs which was fitted to the previous models drls and they dont fit in place of the t20 holders on the later model as they are a different diameter. I wonder if ALL 6c lamp housings use the t20 bulb holders or if some 6c housings use the part number ive just bought or otherwise take ba15s bulbs? I did consider just carefully filing away the plastic on my current lamps to make them fit the holders I just bought but im doubtfull that they will still be waterproof afterwards. If anyone knows of any 6c drls which take ba15s bulbs whithout chopping things id be gratefull because then i can have an oem solution which i can put smaller bulbs in OR if I want to be clever i could experiment with 24volt bulbs of the same rating which of course will be both dim and last forever at 12volts. I did already consider doing this by searching for t20 bulbs in different ratings and voltages but t20 is strictly only available in 12v 20w. 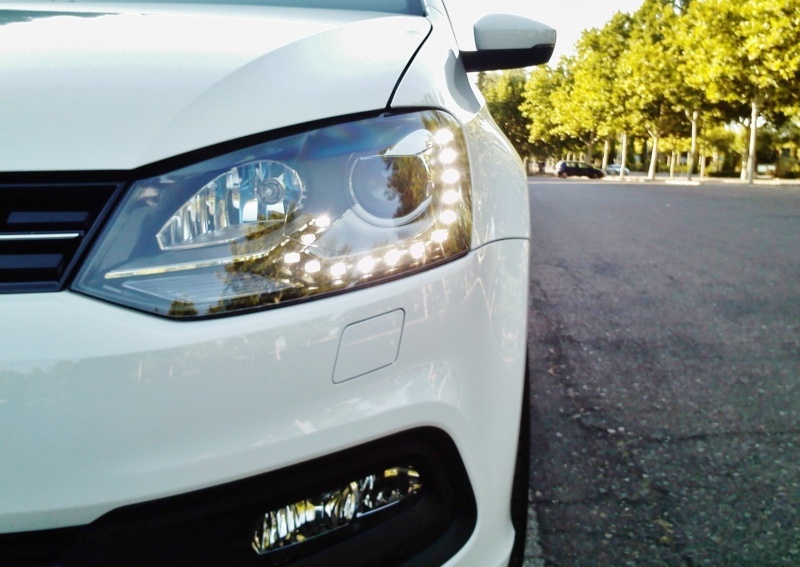 These would be the left and right drl. The interesting part is the dimming options. Maybe it is possible to dim the lights to suit your need. I haven't tried this. Also it is possible to dim the drl when the corrisponding side indicator is blinking. Regarding VCDS. I wont in any case ever buy my own copy because although its seems very good 1) I wouldnt ever have a microsoft infected computer for any reason even if given to me or still running win which is all it runs on. (I used to recycle old atx Pcs and just put linux mint on them all and threw away any hardware that wasnt compatible) The only OS i will touch are apple or linux. BTW the VCDS that i used didnt allow one to get the security codes out of the bcm so if i remember rightly a lot of the settings particularly concerning lights and security etc required a 5 digit code in order to change a lot of settings which neither VW or vcds would provide. massimo23 That is a very good solution and retains all OEM ness about the car as well plus reversible too and im already aware of it. HOWEVER Unless im mistaken WHICH I COULD WELL BE, then the securrity code you posted here is unique to each car and also common across other functions requiring a security code and for your own benifit I suggest thinking twice before posting it publicly. I mean if its the same security code for all cars then wouldnt it cease to be a security code? shurely?? Have you heard of obdeleven pro. It can do mostly what vcds can do. That is what i am using at the moment. It is a bluetooth device and you need an android phone or tablet. They are working on an ios version also if you have an iphone or ipad. Obdeleven has long coding and adaptions and it finds the security code if available on there database. Thanks to the information posted by massimo23 there is nothing cleaner and safer to configure your DRLs (and other lights) at your whim. So, the first comment that I did in this thread is absolutely correct. The information posted by massino23 is in all 6C of this world, including yours, the security codes "to access the coding/adaptation" are known by almost everyone . There are no problem related to security of his car. I think you should open your mind to the diagnostic tools and avoid everything you can do other tests for your DRLs. Your 6C will remain intact. VCDS is my recommendation (nobody pays me for saying it), I have simply achieved fantastic things thanks to this tool, intuitive and easy to use for anyone. On the ross-tech website you can see the compatible supports for this tool. The best thing about this tool is the broad international community that uses it, the info is shared with precision. Other diagnostic tools are gaining positions because they are perfect for the smartphones (vcds too, I think), but someone has to create the information, and the VCDS allows anyone to easily create that information. ... with a lot of patience. Ok please explain how security codes work then? These security accesses are designed so that someone reckless and without knowledge of them is not able to modify the data at random, that is, it is the first reminder that you are going to do something with certain importance in your car. It is something basic and elementary, basic logic. So you mean like each function setting has its own code assigned more like eg a room full of lockers with perhaps one thing in each and each having its own key to put it allegoricaly?? With the security access of a unit you can modify the data. These data have, the specific factory setting for the equipments installed in your car, and more data that are used in other level of equiments and that maybe also can be used for your car. It's very simple once you use it. The advert says it takes a p21w bulb (which I think is the same as ba15s?) but needs a holder (without saying what kind of holder), branded as "johns" alledgedly from hz designs germany with a website that doesnt work.